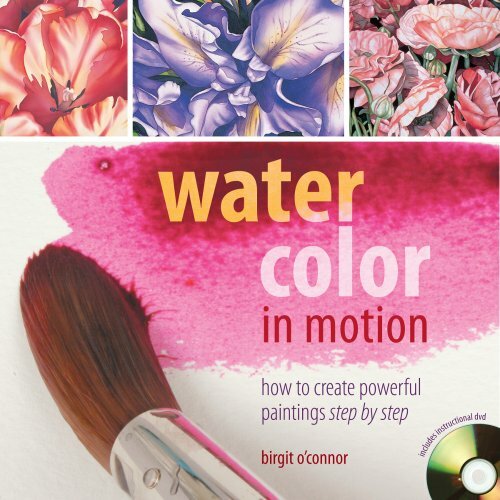 Watercolor in Motion is an insightful watercolour book authored by Birgit O'Connor. If you check out her website, you'll notice the numerous stunning paintings of flowers that use beautiful transitions of colours. In this book, she shares some of the techniques used to create some of her paintings. The main highlight of this book is on blending watercolours to create beautiful transition and gradations of colours. Her techniques will be able to give your paintings the extra visual interest by creating colour interactions. There are several exercises and demonstrations that you can follow along. The instructions are clear, concise and there are accompanying step by step pictures. Each demonstration has the list of pigments used so you can easily follow along. Another huge plus about this book is the DVD that comes with it. The disc has a 50+ minute instructional video that covers the techniques mentioned in the book. Watching the video really provides a better idea on how the techniques actually work. You'll learn how to blend, create hard and soft edges, glazing, the common problems and how to fix them, creating shadows, use techniques like splattering, etc. That's a lot to cover in the video. It's a fantastic book for watercolour learners. It's a good deal for the money because you get the book as well as a video instructional disc.